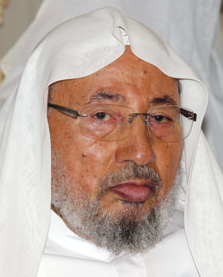 February 22, 2014 The fiery sermon last Friday by Qatar-based Egyptian cleric Yousef Al Qaradawi, in which he repeated attacks on Saudi Arabia and the UAE, threatens to further sour relations between Qatar and its neighbours, wrote Abdel Bari Atwan, editor-in-chief of the news website Rai Al Youm. Many thought that Saudi Arabia’s threats to close its border and airspace and even freeze its relations with Qatar would prompt Doha to ‘silence’ Al Qaradawi and prevent him from giving sermons. The cleric was also behind the crisis with the UAE which, three weeks ago, he accused of being against Islamic rule. The Saudi threats appeared in a London-based newspaper with close connections to Saudi Arabia and the UAE. As the last fiery sermon showed, these threats have failed to stop Al Qaradawi from attacking Saudi Arabia, the UAE and the rule of Field Marshal Abdel Fattah El Sisi in Egypt. Sheikh Al Qaradawi would not make his blistering attacks again without consent from Qatari authorities, according to the writer. The UAE had summoned the Qatari ambassador in Abu Dhabi to protest against the previous remarks made by Al Qaradawi that it deemed insulting to the UAE. The Sheikh’s latest diatribe is likely to further anger many. ‘Were you angry at me because of two lines I said about you. What if I gave an entire sermon just on your scandals and injustices,’ Al Qaradawi said in his sermon in Doha last Friday. That most recent sermon was broadcast on a state television and smashed the reconciliation deal and the pledges made by Qatar’s Emir, Sheikh Tamim bin Hamad Al Thani, to King Abdullah of Saudi Arabia with Kuwait in attendance, during a tripartite meeting in Riyadh in December last year. The Qatari Emir vowed to stop backing the Muslim Brotherhood in the Gulf and Egypt, stop Al Jazeera’s campaigns against the Egyptian authorities and adhere to the line of the GGC States. Meanwhile, Qatari media is reporting that Qaradawi is defending remarks he made critical of the military deposition of former Egyptian president Mohamed Morsi as well as revealing that he has been ill again of late. Our predecessor publication reported in 2012 on what was at that time the latest in a series of hospitalizations of the Global Muslim Brotherhood leader. The GMBDW reported earlier this month that Qaradawi had called upon Saudi Arabia to stop supporting the military-led government in Egypt whom he called “far from God and Islam.” The GMDW has been reporting recently on Qaradawi’s clash with UAE saying that the country was “against Islamic rule.” The GMBDW reported least week that Egypt is seeing his extradition in connection with a mass jailbreak during 2011. Youssef Qaradawi is the most important leader of the Global Muslim Brotherhood and is the de facto spiritual leader of the movement. He is also considered to be the “spiritual guide” for Hamas and his fatwas in support of suicide bombings against Israeli citizens were utilized by Hamas to justify their operations. In 2004, Qaradawi turned down the offer to head he Egyptian Brotherhood after the death of the Supreme Guide and now denies that he has any relationship with the Egyptian Brotherhood. He is based in Qatar and has said the Qatari Emir has protected from being designated as a terrorist by the U.S. He has also reportedly amassed substantial wealth by serving as the Shari’ah adviser to many important Islamic banks and funds. Qaradawi is the head of the Union of Good (UOG), a worldwide coalition of charities helping to raise funds for Hamas and is the leader of the European Council for Fatwa and Research (ECFR), the theological body of the European Muslim Brotherhood. MEMRI has produced two video compilations of Qaradawi’s extremist statements. The first collection contains Qaradawi’s statements about Europe and the US as well as about Israel and Jews. The second collection contains various statements by Qaradawi on social issues such as discussing the killing of homosexuals and stating that beating is “suitable” for some wives. Qaradawi been banned from entering the US since 1999 and UK since 2008. Last year, authorities also refused him entry into France.